I'm pretty sure there are few audiophiles who ignore what Diapason has represented for the HiFi scene during the last ten years. Their flagship, the bookshelf Adamantes, has conquered so many audiophiles worldwide that we decided to publish something special now that 10 years passed since their first introduction back in 1989. A comparision test! Yes! The early Adamantes I versus the brand new Adamantes III. First of all, before I start this review, let me warmly thank Alessandro Schiavi and Diapason for having choosen your beloved TNT-Audio to celebrate such an important event! So, instead of receiving a simple pair of the latest Adamantes III, Alessandro has sent me an old pair (from his private collection) of the early Adamantes I from 1989. It is quite rare to find HiFi products that last for so long time (10 years...and counting) and if I should mention some of these I would name products that have built the history of HiFi, literally, as the Linn Sondek LP 12, the Quad's, the NAD 3020 etc. 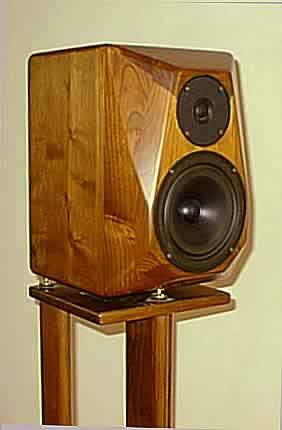 Ten years ago, when the Diapason Adamantes appeared for the first time, many audiophiles labelled them as just another Sonus faber-ish clone or wannabe's. Actually, the real wood used for the cabinet and the elegant form suggested a close relationship. 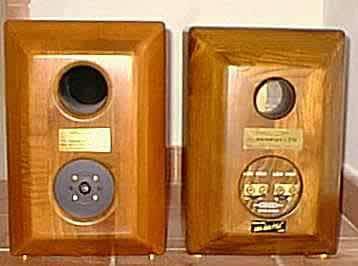 Soon, as audiophiles started to listen to them, the Diapason Adamantes conquered a vast popularity, thanks to their unique sound style, a sound which was quite different from the mainstream. So here they are, virtually unchanged (at least from the outside) after all these years, still representing, together with Sonus Faber, Aliante and few others, the Italian way of loudspeakers manufacturing worldwide. Their unique diamond-shaped (hence the name Adamantes) cabinet has been awarded by the renowned US magazine Audio Video Interiors with a prestigious Design Award and, with minor changes, it is still the same as in '89. 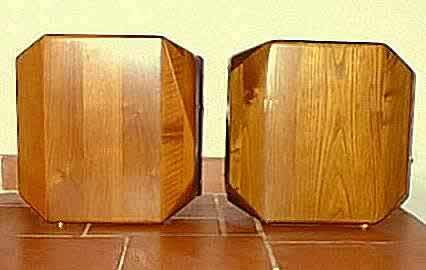 The wood is different tough: chestnut-wood for the 1st series and a costly walnut (called Canaletto) for the 3rd series. The care for the detail and resonance-control is still there, at extremely high standards as before. It is almost impossible to guess, at first sight, which is the 1st series and the 3rd series. A closer look reveals some details which have been imposed by the restrictive CE rules: a metallic grid over the drivers, carefully damped and non-resonant. Then the binding posts: are bananas illegal? Here come the Neutrik Speakon connectors, a bit tricky to get used to, but fully CE compliant. A new woofer has arrived too: this has forced the designer to develop a new reflex port (now larger, see the picture) and a new crossover (now of the DDD type, Diapason Direct Drive, filter-less). The old '89 Adamantes was, of course, completely broke-in so I could listen to it "right out of the box". The new one needed a lot of break-in before I could compare it to it's ten years old ancestor. The break-in period, usually boring, has been very interesting instead: the "Diapason family sound" was evident and the new Adamantes reminded me the character of the smaller Diapason Prelude VS I tested some months ago here on TNT. This means that Alessandro Schiavi knows the kind of sound his loudspeakers should have and this is a warranty for the customer: it doesn't matter if you buy the cheaper or the most expensive model, you will certainly get that distinctive and unique family sound every Diapason loudspeaker has written into it's DNA code. After 20 days of casual listenings I decided it was time for a direct head-to-head: the old Adamantes versus the newer Adamantes. Let me remark that I've not made any direct A-B test because my amp doesn't allow me to connect two different pairs of 'speakers and let me also confess that I hate this kind of tests quite a bit: rapidly swiching from one pair to another puts some stress on the brain and the result may be rather confuse. So I decided for a 30 minutes test for each pair of 'speakers: 30 minutes with the old pair, then 30 minutes with the new one, then back again, ad libitum. These were my findings: it is suddenly clear the two Adamantes belong to very different Audiophilogical Ages. While the old pair seems to feel comfortable with powerful die-hard solid-state power amps, the new pair seems to appreciate even low powered gentle tube amplifiers. It is a sign o' the times (thanks, Prince :-)): while sophisticated tube amps are all the rage nowadays, they were almost "out" ten years ago. And a clever 'speakers designer has to adapt the character of his designs to the "current" sound. You may know that HiFi was very different during the 70s, for example. The Adamantes III is slightly more efficient than the old one and the sound flows effortlessly and naturally. Certainly the non-filtered woofer (the Direct Drive technique) has something to do with this and even the transient response in the bass is faster. The bass range goes lower, too, though it is already surprising (given the real size of the cabinet) even in the early model. Now the Adamantes II can rival with many floorstanders for the quality and the extension of it's bass range. Both the new and the old Adamantes can be driven by low powered amps and listened to even at very low sound pressure levels. No compression can be heard at high listening level, though and the tonal balance remains virtually unchanged. The mid range is always very sweet yet mucho detailed, with a touch of extra presence for the newer Adamantes III with respect to the old ones. Also, the mid range of the present Adamantes is warmer and possesses a "full" body while the old series is slightly colder and thinner. The 3D soundstage is very large and well extended back and forth with the Adamantes III. 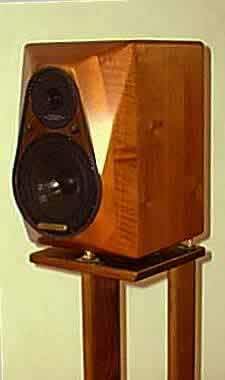 The early model offers a scene which remains solidly BEHIND the loudspeakers. Please take into proper account that, because of the more powerful bass response of the new model, this has been placed 50 cm nearer to the listening position (hence the old model was 50 cm closer to the rear wall). Both the 'speakers produced a very brilliant soundstage, precice and rich of detail. Not exactly a hyper-analytical kind of "illusion" but I prefer this way, Music becomes far more enjoyable and "realistic". The Adamantes III is a very good do-it-all 'speaker: jazz, blues, classical, pop...they can play everything with gusto. They are meant for a mature audiophile, a kind of guy who has healed from his audiophila nervosa crisis and now concentrates on Music only. As for me: which one would I choose? No doubt about this, I'd choose the newer Adamantes III which seem to fit my tube amp very well. The price seems adequate with the quality of these 'speakers, and appears to be convenient if you think you're buying a product which is built to last for years, retaining a very high value as time passes. Anyway, the Diapason crew is not sleeping but it is working to some new projects and, besides the expensive Adamantes Limited Edition (see their site for details), a new floorstander seems to be on the design desk. I have no doubt it will be a success and possibly a landmark 'speaker (Diapason makes few models....each one we've tested belongs to a league of it's own...).